This article is a short summary of Hyrule Warriors Legends. Zelda Wiki features a more in-depth article. 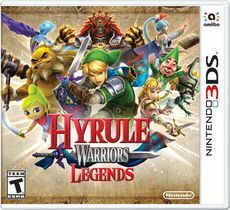 Hyrule Warriors Legends is a Nintendo 3DS version of the game Hyrule Warriors, released in 2016. While the game is a full port of the original game, including the downloadable content, the game also includes several new features. Purchasing the game allows players to download a free HOME Menu theme based on the game. Cut down entire legions of enemies using over-the-top powerful Dynasty Warriors-style moves as Hyrule Warriors comes to the Nintendo 3DS family of systems. In the portable version, experience new story elements and playable characters from by The Legend of Zelda: The Wind Waker game such as Tetra, King of Hyrule and more. Additional new features, such as the ability to switch between different characters on the fly, allow you to strategically position characters and defeat foes in all-new ways like never before. The entire Wii U version of the Hyrule Warriors game, playable on the Nintendo 3DS family of systems. Play and experience new characters and story elements based on The Legend of Zelda: The Wind Waker game. New character switching feature lets you change characters on the fly. For the first time in the series, play as fan-favorite characters like Tetra and King of Hyrule. Battle the fiercest enemies from The Legend of Zelda across Hyrule’s most famous locales. Advance the story to unlock new playable characters, each with unique moves and weapon types. Collect Rupees and other useful items to upgrade weapons and craft badges, which players can use to bolster each warrior’s abilities. Cut down entire legions of enemies as fan-favorite Legend of Zelda™ characters using powerful moves as Hyrule Warriors comes to the Nintendo 3DS™ system. Control multiple characters to enhance your strategies and enjoy new story elements with playable characters from The Legend of Zelda™: The Wind Waker, such as Tetra, King Daphnes, and more. War rages as the delicate balance of the Triforce is disrupted. The kingdom of Hyrule is once again being torn apart by a dark power, this time lead by Sorceress Cia. Now it's up to the legendary hero Link™ to face hordes of enemies and find the missing Princess Zelda™. Advance the story to unlock new playable characters, each with unique moves and weapon types. Collect Rupees and other useful items to upgrade weapons and craft badges, which you can use to bolster each warrior's abilities. War rages as the delicate balance of the Triforce is disrupted. The kingdom of Hyrule is once again being torn apart by a dark power, this time led by Sorceress Cia. Now it's up to the legendary hero Link™ to face hordes of enemies and find the missing Princess Zelda™. Advance the story to unlock new playable characters, each with unique moves and weapon types. Collect Rupees and other useful items to upgrade weapons and craft badges, which you can use to bolster each warrior's abilities. Gameplay mostly remains the same as the console version. The top screen displays the battle, while the bottom screen displays the map and character stats. By tapping the character icons on the bottom screen during battle, players can switch to playing as that character. Two new pickup items have been confirmed for this game: A golden Ocarina that warps players to Owl Statues, and a Hammer weapon. In order for the game to display as many enemies as possible, the stereoscopic 3D feature for standard Nintendo 3DS systems will be disabled; only New Nintendo 3DS systems will have the 3D feature. New content in this version includes additional playable characters, as well as a new set of story missions. All of the new content except for the story missions can be transferred original version of the game via a serial code printed on the back of the box. The game will also feature all of the downloadable content included on the Wii U version, though this cannot be transferred. The Challenge Mode in the Wii U version, however, in addition to multiplayer support will not be in this game. amiibo will also be compatible with this game; in addition to the amiibo usable on the Wii U version, scanning the Wolf Link amiibo unlocks special weapons for Midna. 1.1.0 February 9, 2016 Adds the ability to reset save data, fixes a glitch that causes the game to crash if too many 2D elements are onscreen, fixes a glitch that prevents players from receiving a reward after defeating a Network Link. 1.2.0 March 25, 2016 Adds the ability to purchase downloadable content, fixes a skill rental glitch, fixes a glitch in which the player slows down after being hit, adjusts the patterns for giant bosses. Comes with the digital release outside of Japan. 1.3.0 May 19, 2016 Adds Medli as a playable character, adds new Medals, gameplay adjustments. 1.4.0 June 30, 2016 Raises the maximum level to 150, adds new medals, adds a new fairy for My Fairy mode, gameplay adjustments. 1.5.0 September 1, 2016 Raises the maximum level to 200, adds new medals, adds a new fairy for My Fairy mode, gameplay adjustments. 1.6.0 October 30, 2016 Raises the maximum level to 255, adds new medals, adds a new fairy for My Fairy mode, adds new Rental Skills, adds new Apothecary mixtures, adds the "Heart Power" skill for weapons, adjusts the maximum food drop number, gameplay adjustments. Like with Hyrule Warriors, four downloadable content packs will be released throughout 2016. Like with the original game, players can purchase separately, or buy the "Legends of Hyrule" season pass. By purchasing the season pass on launch day, a costume for Ganondorf based on his appearance in The Wind Waker is unlocked. Note that this content (with the exception of My Fairy costumes and the Adventure maps) will also be available for Hyrule Warriors on the Wii U and can also be purchased for both versions. Master Wind Waker Pack: Exclusively available for Hyrule Warriors Legends, includes new My Fairy costumes and a new Adventure Mode map. Link's Awakening Pack: Based on The Legend of Zelda: Link's Awakening, includes a new playable character, a new Adventure Mode map, new My Fairy costumes, and a new weapon for Linkle. Phantom Hourglass & Spirit Tracks Pack: Based on both The Legend of Zelda: Phantom Hourglass and The Legend of Zelda: Spirit Tracks, includes a new playable character, a new Adventure Mode map, new My Fairy costumes, and a new weapon for Toon Link. A Link Between Worlds Pack: Based on The Legend of Zelda: A Link Between Worlds, includes two new playable characters, a new Adventure Mode map, and new My Fairy costumes. ↑ 1.0 1.1 Hyrule Warriors Legends: more characters to be revealed, amiibo support confirmed. Perfectly Nintendo (September 19, 2015). Retrieved September 19, 2015. ↑ Hyrule Warriors Legends: first update available (Ver. 1.1.0). Perfectly Nintendo (February 9, 2016). Retrieved March 7, 2016. ↑ Hyrule Warriors Legends version 1.2.0 out in Japan later this month. Nintendo Everything (March 6, 2016). Retrieved March 7, 2016. This page was last edited on 15 August 2017, at 18:44.